Today, at the call of Prince Volodymyr, all citizens of Ukraine, regardless of confession, religion, language, and political party are called to this unity. This unity in the name of the common good of our people is an imperative of civil conscience. Such a position was expressed by the Father and Head of the Ukrainian Greek Catholic Church His Beatitude Sviatoslav on July 28, on the day of the memory of the Equal-to-the-Apostles Prince Volodymyr. The Head of our Church tооk part in the state celebrations of the 1030th anniversary of the Baptism of Rus’-Ukraine together with the President of Ukraine, members of the All-Ukrainian Council of Churches and Religious Organizations, the delegations of the Ecumenical Patriarchate and members of the Government of Ukraine. 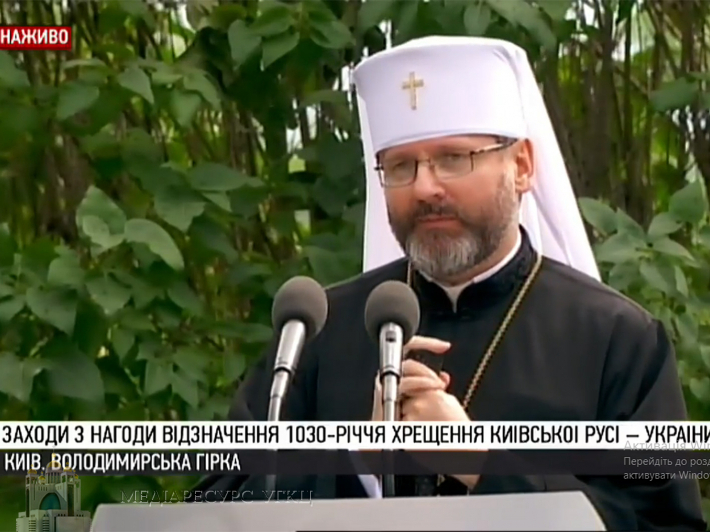 In his speech, the Primate first of all congratulated everyone on behalf of the Ukrainian Greek Catholic Church - the heiress of Volodymyr Baptism, whose faithful today live in Ukraine and on all continents of the world. His Beatitude emphasized that this year, as never before, we should see the path of our enlightener and baptist, the Equal-to-the-Apostolic Prince Volodymyr. "We see that his way to Baptism was a way of finding the unity and power of the Kyivan state, the road to the unification of various Slavic tribes into a single God's nation. There, near the walls of Chersonese, he saw the light of God. He was told that the source of unity is God the Father. The Lord Jesus Christ is the cornerstone оn which the Kyiv state can be built. The power of communion and unity is the Holy Spirit. And then he accepted baptism in the name of the Father, and the Son and the Holy Spirit," said the Head of the UGCC. "We understand that the unification of the entire human race in the one Holy Apostolic Church is the work of God. Therefore, Christians today pray for unity among themselves. This unity is based on the fact that Orthodox, Catholics, Protestants are baptized in the name of the Father, the Son, and the Holy Spirit. The Church is the sacrament of unity of the entire human race," said the Primate. "The task of uniting the Churches is the work of God," says His Beatitude Sviatoslav. – “And He determines to us times, ways, opportunities for finding the unity of all Christians, especially the unity of the heirs of Vоlоdуmуr’s Baptism. Therefore, today we pray to the triune God for the unity among those who believe in Him." There is also another call. "This is a call to unification. Today, at the call of Prince Volodymyr, all citizens of Ukraine, regardless of denomination, religion, language, and political party, must join this unification. This consolidation in the name of the common good of our people is an imperative of civil conscience. There are no obstacles or excuses for those who refuse to unite in the name of their state. An example of such unity was the Revolution of Dignity. And an example of solidarity of our nation is our fight for independence today," stressed the Head of the UGCC. Therefore, on this day, а prayer as well as а call can be heard. "A prayer to God for the unification of all the children of the Church of Kyiv and the call to all citizens of Ukraine to unite and to put the common good at the highest priority now. The power of nation is in unity. May God offer us unity," said His Beatitude Sviatoslav at the end.